A task that includes finding the real estate assets that are a fit with that particular community’s industry target. Gulf, Franklin, Liberty and Gadsden counties are continuing work on a zoning project with high hopes of attracting industry to their rural corridor. The area links interstate and state highways, a railroad line, an airport and a seaport in a freight logistics zone (FLZ). The firm used its Strategic Site Inventory (SSI) process to assess the FLZ. A report published by his company in 2017 assessed the corridor’s site selection and economic development possibilities. The assessment used five phases. Phase one was site discovery — articulating geographic features which would either benefit or hinder development; identifying sensitive environmental properties; the available labor force; and utilities planned or in place. The site search found 19 new potential commercial and industrial sites for Gulf, Liberty and Franklin counties. Gulf County had seven sites identified, Liberty had six and Franklin also had six. Previously, under a grant from Duke Energy, Leotta’s process had identified 20 sites in Gadsden County, one of which is the focus for the FLZ project. According to the report, primary transportation access included an array of rail-served and non-rail served sites with state highway access, airport access and seaport access. Phase two was to do preliminary engineering and environmental due diligence, a “desktop exercise,” Leotta said. Phase three was to assess landowner engagement and to move properties to market. Phase four, should a site warrant that level of engagement, is to engage in formal engineering and environmental due diligence. Phase five is to work on community branding and marketing for the chosen sites. Leotta said his firm spent about three months combing through the four counties in 2014. “We were interested in finding the real estate assets that are a fit with that particular community’s industry targets,” Leotta said. The idea was to provide a set of strategic sites throughout the FLZ that would either serve to host an anchor project or play a supporting role for a project in another location, Leotta explained. The plan calls for two such centers — one at I-10 and one at the Port of Port St. Joe — on either end of the Apalachicola Northern Railroad. A 600-acre site located in Gretna just south of I-10 and adjacent to the railroad is one of the two proposed ILCs. City manager Antonio Jefferson is working to extend Gretna water and wastewater services to the site, which already has power provided by Talquin Electric Cooperative. “The site is unique because it is on I-10 and is high, dry and relatively flat,” Jefferson said. Jefferson, who serves as board chairman for the Development Council, is a student of economic development as well as a leader. 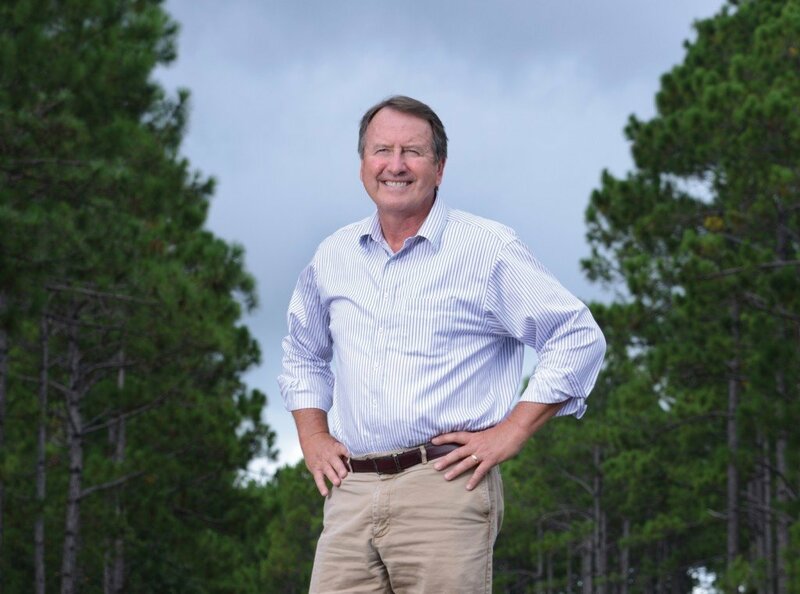 He has completed courses offered by the International Economic Development Council and is leading one of three Florida Rural Areas of Opportunity. On the southern end of the zone, Warren Yeager has been the economic development director for Gulf County for nearly a year and served as a county commissioner for roughly 15 years. “One of the reasons we want to be involved (in the development of the FLZ) is because of our port,” Yeager said. His interests lie in the economic redevelopment of Port St. Joe, which used to engage in profitable shipping practices in the ’80s, but they tapered off when the paper mill went out of business. “It got to the point that we just didn’t have product to ship out,” Yeager explained. He is interested in seeing the port develop into a functional site, connected to the railway. The answer: Yes, but the rail line leading to the port is in need of repair. The St. Joe Company owns the rail and has agreed to provide a financial match once a company agrees to invest in the area. There is also an appropriation for dredging the channel, which Yeager explained is a long-term project. Eastern Shipbuilding has a lease on 20 acres on the mill site on about 1,000 feet of bulkhead, Yeager added, and an application for Triumph funds (a settlement fund from the BP Horizon oil spill) to build a 420 x 120 foot floating dry dock has been filed. The dock would go a long way toward fulfilling a contract with the Coast Guard to build cutters. “There’s a lot going on right now. We should see some activity in the next few months for spending $6 million for improvements,” Yeager said.